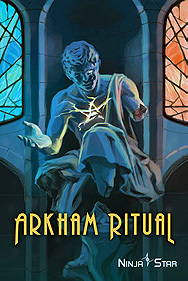 In Arkham Ritual, you only have one card in your hand but you cannot see the card you are holding. Instead, you only see everyone else's cards. Players draw cards from the deck and pass them around. By looking at the other players' cards and the discarded cards, you need to figure out what you're holding. If you have the right card at the end of the round, you will survive the ritual. However, if you have the wrong card...the ritual will consume you and you will go insane!! Will you be able to investigate the ritual and escape from it alive! ?